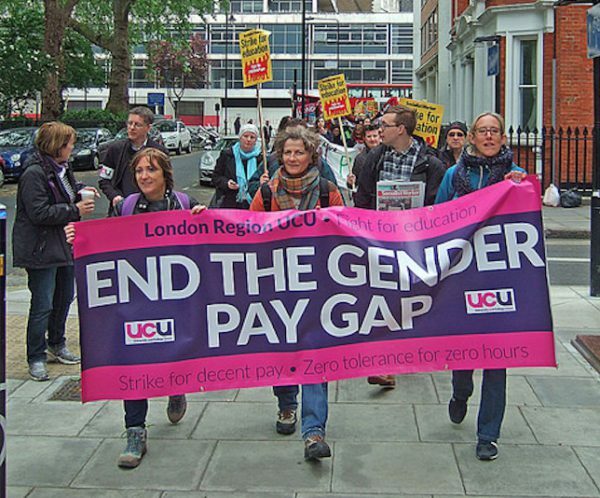 UCU has called a five-week ballot for industrial action over pay this term. It opens on Tuesday 15 January and closes on Friday 22 February. It is timed for the maximum duration while still allowing members to take hard-hitting strike action this term and hit exams next term. So if we win the ballot we can take serious action. First and foremost, this ballot is an organising challenge for every branch. Thanks to the Tory anti-union Trade Union Act, more than 50% of members eligible to vote must participate. Even if 100% vote YES, if only 49% vote, the vote does not count. The main reason members do not vote is simply that they forget. Paper ballot envelopes and forms are put aside and forgotten about. We have to set up the type of grassroots organisation that makes sure that everyone is asked to vote, encouraged and reminded right up to the deadline. We know that when we get this right, we get a high turnout. We know how to do this, but we are all shockingly busy. We know workload – one of the key demands of the campaign – is ridiculous in our sector. We must make a conscious effort to get organised. We have to treat the organisation of getting the vote out with exactly the same seriousness and care as when we organised the strike over pensions last year, and when we fought local campaigns over redundancies in the past. The evidence shows it can be done, but we have to make a decisive shift to get the turnout.This is the second ballot we have had over the same pay round. In the Autumn, the overall turnout was 42%. It was a ‘disaggregated’ ballot: each branch was counted separately. 7 institutions got over 50% turnout. One branch, Herriot-Watt, got a 64% turnout, many of the big branches got between 40 and 50%. The votes for strikes and ASOS were overwhelming, but they could not be actioned. organise members to systematically remind colleagues in each department, just as we would if organising a picket line rota. The 50% threshold is a deliberate anti-democratic burden, designed to prevent unions from striking even when votes in favour are overwhelming. Step 1: vote yourself, and Step 2: ask your colleagues to vote. Generations fought for the right to vote. Don’t let passivity undermine democracy. We need to set up action committees to carry this out. We cannot leave it to a few branch reps. Every member has a stake in this fight. This is a political fight as well as an organisational challenge. In the autumn, the high YES votes indicate members were convinced by the arguments. Pay. Our pay has been cut by at least 15% since 2008. UCU’s latest figures put the drop by as much as 21%. 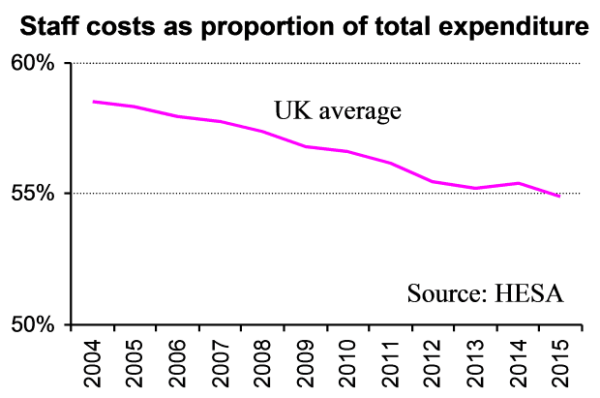 Every teaching assistant struggling to get by, every teaching fellow on a part -time contract, every researcher on fixed funding stuck near the bottom of the pay spine, each one is 15-20% poorer than they would have been a decade ago. Cuts in the rate for the job mean everyone is devalued. The pay offer of 2% this year is still a pay cut. Members in USS branches can expect their pay cut further. Inequality. One result of low pay is that staff try to increase their pay by other means. We are seeing more individual bargaining and consequentially greater pay inequality. Individual bargaining (threatening to move and demanding a pay rise or moving and negotiating) tends to favour white male staff over women and BAME staff, and increases gender and ethnicity pay gaps. The shocking stories published by the BBC last week are a symptom of this. Workload and casualisation. High workload and low pay are two sides of the same coin. The employers have used the fear factor of redundancies and casualisation to force up workload in our sector. If we do not fight to secure the casualised, the employers will casualise the secure. As the USS dispute showed, strike action allows us to push back against the workload tide we all struggle with. This ballot helps us put the issue on the map and demand action to cut excessive workload or increase paid hours. But the situation has developed in two important respects. What follows is a sketch of the new arguments we are likely to face, and some suggested counter-arguments to make. In USS branches, a strong YES vote also puts us in the best position to ballot over USS cuts. The future of the UK, and UK universities, is uncertain because of Brexit. Universities don’t know what will happen to student recruitment. We don’t even know whether UK universities will be able to bid for EU research funds, or if they can, on what basis. Now is the wrong time to fight. We should ‘wait and see’. This is a perfectly understandable argument, but the conclusions are wrong. Instead of waiting, we need a big YES vote to give the union and members a voice. A strong YES vote with a high turnout gives the union the mandate with the employers and government to be taken seriously. It puts the union in a position to negotiate with the employers over pay and jobs precisely at the time when the employers may be looking for job cuts and pay cuts to pay for the mess they have got themselves into. We can decide what we do with that mandate once we have it. But first we have to get the votes. The USS dispute taught members two important lessons: we have power when we strike and hit lessons and threaten exams, and – with a credible threat of strike action – ‘impossible’ demands become possible. In the middle of the strike, the Chinese Embassy relayed a threat from the PRC Government to Universities UK: if strikes hit exams, Chinese students will not come to the UK next year. Crucially, we need to put the universities on the political radar as a sector to be strategically defended in the aftermath of Brexit. This means members standing up to be counted, voting YES in large numbers and taking action to defend themselves and the sector. A strong strike/ASOS vote over pay is the best protection against threats to jobs. A well-organised Get the Vote Out operation can be repeated for a local ballot over redundancies. Brighton University had a strong GTVO campaign over redundancies. Despite being a post-92, they got over 50% turnout in the autumn. If one crisis were not bad enough, the Tories are flirting with the idea of creating another. Whereas the Brexit timetable appears to be outside their control, this ‘crisis’ is entirely of their making. As we know, in 2011 the ConDem government jacked up undergraduate ‘home’ university fees from £6,500 (£3,000 paid by the student) to up to £9,000 per student. The universities charged the maximum, £9,000. At the same time, the Government set up a complex new loan system covering fees and maintenance grants, and partially abolished the block grant payable to each department. The Government racked up a mountain of debt to pay for these loans, which the Treasury projected as £90bn by 2021, of which only half will probably be repaid. This is the first – and by far the largest – debt crisis, one they have mainly kept secret. Meanwhile, in 2014 the Government took the next step in the ‘Willets Plan’ and abolished limits on student numbers (except for a small number of subjects like medicine). These changes created a situation where universities realised they might make vast amounts of money by expanding in competition with other universities. The new motto of the sector, including of the posh universities, was ‘Pile ’em high and teach ’em cheap’. Competition creates winners and losers, and the winners gambled in a building and borrowing boom. Universities that reckoned they could grow have borrowed huge sums. According to the Times newspaper, the sector has £10.8bn in debts. UCL tripled their undergraduate recruitment and are building a new campus in East London, where they will be joined by the University of the Arts. Both are borrowing hundreds of millions of pounds. Meanwhile, other universities, particularly those traditionally recruiting working class or mature students (post-92s, Open and Birkbeck), are seeing student numbers fall. High fees and the opening of spaces in ‘big name’ colleges is hitting them first. The HE funding crisis started at colleges like London Met, and spread across post-92. It is now hitting pre-92 universities through restructuring and redundancies. The employers want to pass the risk and cuts on to staff, as the USS pension fight shows. But the Tories are considering turning a chronic crisis into an acute one. They are leaking proposals from the Augur review of Higher Education funding they commissioned last year. This report seems likely to propose a cut in undergraduate ‘home’ tuition fees to £6,500 at exactly the same time as new EU students are reclassified as ‘overseas’. Behind the scenes the universities are frantically lobbying the Government to stop the cut unless the Government makes good the difference. At least three prominent Tory ex-ministers have now spoken out publicly. There is no particular need for the Tories to press this button now. But it is a stark reminder that we have battles ahead. We must not misunderstand the weakness on the Government side. Macho talk from the ‘Office for Students’ that ‘no university is too big to fail’ misses the obvious point that if even one small university closes, several thousands of students will be out on the street with debts and no degree – and the OfS has no Plan B. A spate of college and course closures triggered by Government incompetence would create a massive political crisis. US scandals like Corinthian Colleges and Trump University will be a tea party by comparison. What does this mean for our ballot? Just like the arguments about Brexit, we have to argue that if we don’t fight, we will lose. A strong YES vote puts us in the best possible position to defend pay and resist job cuts, whether they be triggered by Brexit uncertainty, university restructuring or college closures. 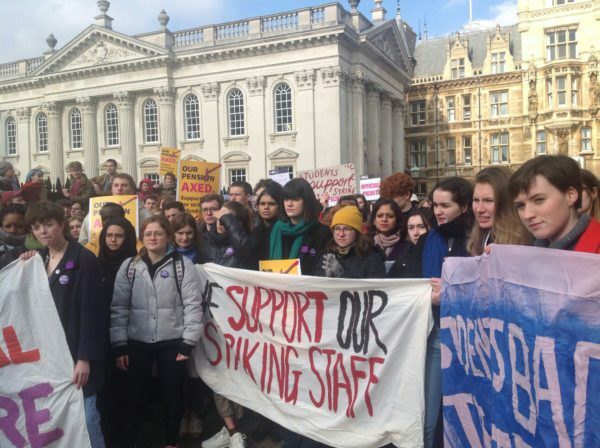 It also emphasises the point we made throughout previous strikes on every issue: we ask students to defend staff on strike, because through our strikes, staff are defending Higher Education. The splits in the Tories show that we have everything to fight for. The truth is that the collective ability of staff to shape the direction of Higher Education ultimately depends on our ability to win industrial action ballots. We need to get organised. The stakes could not be higher. Every member, every activist and every rep must be mobilised. We have five weeks to defend our sector and win the turnout we need.